It has been said that great events turn on relatively small matters. D-Day, June 6th, 1944. Arguably the most important date of the twentieth century, for on it the pivotal battle of World War IIwas fought. It had many such small matters which set the stage for the liberation of Europe and the defeat of the Nazis, from the Ox and Bucks’ daring glider-borne assault on Pegasus Bridge, to Easy Company’s battle for the gun battery at Brecourt Manor, all contributions to victory in a larger battle. Of all the many incredible stories from the longest day, there is one which stands out as one of the most dramatic. That is the story of the two American Ranger battalions and the Battle of Pointe du Hoc. In contrast to the scope of what General Eisenhower called the great crusade, the U.S. Army Rangers part in the invasion was comparatively minor, but with far reaching aftereffects that contributed to the success of D-Day. This is an overview of that battle, June 6-8th, 1944, and its key players that affected the outcome of this little know yet significant small unit action on D-Day. 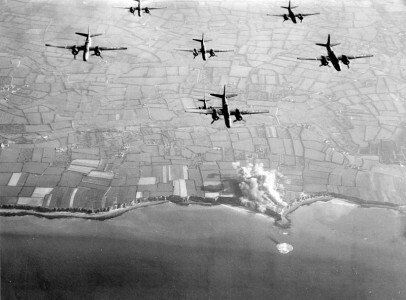 A-20 Havoc bombers hit Pointe du Hoc in the days before the invasion. Of the five Normandy invasion beaches in Operation Overlord, the one which stretched between Porten-Bessin and the Vire River, codenamed “Omaha”, was to be assaulted by two divisions from the U.S. Army’s Fifth Corps, the 1st & 29th Infantry Divisions, whose job it was to establish a beachhead well beyond those areas on D-Day. Attached to the 116th Regimental Combat Team, the 29th Division was the Provisional Ranger Group, the 2nd and 5th Ranger Battalions, under the command of Lt. Col. James E. Rudder. The primary mission of this Ranger Group was to eliminate six German 155mm coastal guns placed in bunkers and casemates atop the 100 foot cliffs of Pointe du Hoc, which was approximately four miles west of the Omaha Beach landing zone. From the Pointe these large caliber guns had the range of about 12 miles in all directions. This meant that Utah Beach, farther west, Omaha Beach, and the thousands of transports and warships in the English Channel, were well within the range of these weapons. The original D-Day plan called for Rudder to split his two Ranger battalions into three Task Forces: A, B, and C. Their overall purpose was the elimination of the guns of Pointe du Hoc and securing the western flank of Omaha Beach. Force A, consisting of Dog, Easy and Fox Companies of the 2nd Ranger Battalion, was to make an assault from the sea directly up the one hundred foot cliffs of Pointe du Hoc, using ropes and grapnels fired to the top of the cliffs by rockets, then eliminate the six coastal guns by placing thermite grenades in the gears and breaches of the weapons to prevent them from firing. The plan called for Dog Company to land and scale the west side of the Pointe, while simultaneously Easy and Fox Companies assaulted the east side. This task force numbered 225 men, with 64 men comprising an individual Ranger company and additional Rangers composed of headquarters personnel. After putting the guns out of action, Force A was to move on to their secondary objective a mile inland from the cliffs and fortifications on the Pointe. There they were to secure the black-top Vierville highway, running east to west along the coast, to prevent the movement of German troops to Utah or Omaha and cut all communication wires running along it. Force B, Charlie Company of the 2nd Rangers, had a mission entirely separate from Pointe du Hoc, which was to assault Pointe du la Percee, the extreme right flank of Omaha Beach, also referred to as D-1 Exit by U.S. planners. Once across the beach, Charlie Company would scale the bluffs then eliminate German strong points situated above the draw, so as to enable the 116th Regiment’s advance off of the beach and open the way to the village of Vierville itself. Subsequently, when Omaha was secured, Charlie Company was to proceed overland to Pointe du Hoc with units of the 116th and rejoin Forces A and C.
Once up the cliffs of Pointe du Hoc, the Rangers of Force A, were to signal “Praise the Lord” to their brother Rangers of Force C, the entire 5th Ranger Battalion plus Able and Baker Companies of the 2nd Rangers were to follow them up the cliffs and reinforce the secured highway. Then together with the Force A Rangers, and the 1st Battalion, 116th Regimental Combat Team from Omaha, they were to drive west toward Grandcamp and Maisy, two other German strong points farther west along the Normandy coast. However, if these Rangers of Force C received the signal “Tilt” or no signal at all from Force A by H-hour plus 30 minutes (0700 hours), they were to be diverted east to sector Dog Green of Omaha Beach, proceed overland to Pointe du Hoc ahead of the 116th Regiment and eliminate the guns if they hadn’t been taken out, as well as relieve their fellow Rangers of Force A. At 0645 hours, the ramps to LCAs 418 and 1038 dropped open to reveal the bloodied sands of Omaha Dog Green to the men of Charlie Company, 2nd Rangers. Preceding them by nine minutes at the very head of the first wave was Able Company, 116th Regiment. This company, know later as “The Bedford Boys”, suffered two-thirds casualties in killed and wounded during the first horrific minutes of the invasion. Many men were gunned down before they even had a chance to exit the landing craft by German machine gunners on the bluffs overlooking the beach. On the bluffs overlooking the beach several hundred yards away, German machine guns, mortars, and artillery, that had ripped Able Company to pieces, now tore into Charlie Company with the same ferocity. LCA 418 contained Captain Ralph Goranson, the company commander, 1st Platoon leader Lieutenant Bill Moody, and about thirty Rangers; as this was the usual number of men an LCA was able to hold. Goranson, was the seventh or eighth man off, and as he stepped off the ramp enemy mortar or artillery rounds scored direct hits on the LCA. Looking back he saw that the ramp was completely blown off and what Rangers that remained in the landing craft were climbing over the side and dropping into the surf. Lieutenant Sid Salomon, 2nd Platoon leader of Charlie, was the first to exit LCA 1038, jumping off on the right side of the landing craft into waist-deep water. Directly behind him came Sergeant Oliver Reed, who leaped off on the left side of the LCA and was shot instantly. As Reed was about to be dragged under the landing craft’s ramp by the surf, Salomon, braving enemy bullets churning the water around him and the sergeant, grabbed Reed by the collar and pulled him to relative safety onto the beach. Leaving Reed with another injured Ranger awaiting treatment, Salomon was knocked off of his feet by the concussion of a mortar blast behind him. Thinking he was about to die after feeling a shrapnel wound in his back, he unsuccessfully tried to remove the operations map from his jacket and give them to his platoon sergeant. But when sand kicked up by bullets began hitting him in the face he found new incentive to live and got up and run the rest of the way to the base of the bluffs. Though this was their first time in combat, the Rangers were all volunteers that where highly motivated and highly trained to do what the regular infantrymen of the 116th could not do under the circumstances – keep moving. 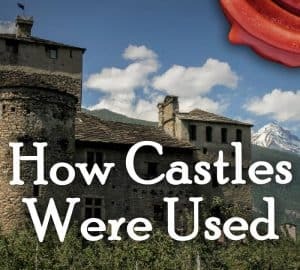 As Salomon ran the rest of the way to the base of the bluffs, he saw men from the 116th, who were taking cover wherever they could, look up at him in surprise as he and his men ran past. It should be noted that these men of the 116th, mostly comprised of the slaughtered Able Company that preceded the Rangers, were not cowards, but simply exhausted from sickness, scared and in shock from seeing their friends killed by the dozens right before their eyes. For the only way to survive was to brave the intense enemy fire and cross the exposed 300 yards of beach that was a killing zone. In order to live on Omaha in those first terrifying minutes of the invasion, the soldiers had to risk everything in one long dash to the beaches’ seawall; which only offered a small bit of protection from the unrelenting enemy fire. Sure that he was hit while crossing the beach, Goranson checked himself for wounds, only to find that nine different bullets had penetrated the excessive amount of gear which he was carrying, but not one struck him. No sooner had Goranson make it to the seawall below the bluffs when he heard a fellow Ranger screamed “Mashed potatoes!” Mystified by the man’s statement, Goranson inquired of his meaning. “Right between your legs!” the Ranger screamed back. Looking down, Goranson saw a German concussion potato-masher-type grenade with the fuse smoking right between his legs. Quickly he swung his legs away and hunched up, escaping the blast without a scratch. At about the same time Sid Salomon also reached the seawall, where a medic removed the shrapnel from his back and applied sulfa powder to the wound. After that Salomon would climb the ninety-feet up the bluff via a rope, which was carried to top and secured by Private First Class Otto Stephens who pulled himself up the cliff while cutting handholds with his bayonet. When Salomon reached the top he found only nine Rangers left from his 2nd Platoon. 35 of Charlie Company’s 64 Rangers were casualties at this point, with nineteen of that number killed. Supported by twenty soldiers of Baker Company of the 116th, these Rangers, despite their horrendous casualties, proceeded with their original mission. Led by Goranson, they infiltrated the German trench system overlooking Dog Green, then eliminated several enemy machine guns in bunkers and dugouts that had been slaughtering other G.I.’s coming ashore, thus improving the odds for their fellow soldiers struggling to get off the beach. Sometime around 1430 hours, Goranson led a patrol to reconnoiter the company’s original objective, Pointe du la Percee, only to find the German positions eliminated by gunfire from the Channel. With their objective destroyed, Charlie Company would eventually linkup with Force C, and participate in the battle beyond the Omaha beachhead. Just as the nine LCAs and three DUKW landing craft carrying the Rangers of Force A began to close the last 1,000 yards to shore, Colonel Rudder, in the lead LCA, realized that they were heading to the wrong cliff. Heavy seas combined with poor navigation and an eastward tidal current had pushed the LCAs off course towards Pointe du la Percee; Force B’s objective. Unaware of this, the naval pre-bombardment shelling was lifted at 0625 hours as planned to allow the Rangers to land five minutes later. However, German defenders, who had taken cover during the aerial bombing and naval shelling, emerged from their bunkers, reorganized and remand fighting positions to greet the approaching LCAs. Nevertheless, Rudder ordered the little flotilla to flank right and run parallel to shore toward their intended objective, Pointe du Hoc. Finally, between 0705 and 0708 hours, after running a three mile gauntlet of German small arms fire from the cliff tops, Force A touched down at the base of Pointe du Hoc. Because they were behind schedule, Rudder had Dog Company land on the east side of the Pointe, between Easy and Fox Companies, rather than loose anymore time by having them land on the west side as originally planned. LCA 888, containing Rudder, headquarters personnel and Rangers from Easy Company, was the first to land. German soldiers appeared on the cliff top to fire down on the Rangers as they exited the landing craft, but Sergeant Domenick Boggetto opened fire first with his Browning automatic rifle (or BAR) and shot a German soldier, whose lifeless body then fell off of the cliff onto the beach below. The other Germans momentarily disappeared from view only to reappear again firing and throwing grenades down at the Rangers. Even before the LCAs dropped their ramps, each one fired their six boat-mounted rocket-propelled ropes tied to grapnels up the cliffs. However, many failed to reach the top due to sea spray which water logged many of the ropes and made them heavier than they would have been. Racing from their LCAs to the base of the cliff, while receiving enemy fire from both flanks and above, the Rangers set up portable rocket-launches and grapnels directly below the cliff face and fired enough ropes to the top to begin their climb. While this was happening, the destroyers U.S.S. Satterlee and H.M.S. Talybont, who along with other ships had lifted their supporting fire for the Rangers at 0625 hours, now sailed close to shore and risked running aground to give much needed close fire support for the Rangers. Though receiving enemy small arms fire herself, the Satterlee temporally drove the German defenders to cover, lashing the cliff tops with fire from her 5-inch, 40mm and 20mm guns. This proved to be a godsend for the Rangers, as they began their climb up the cliffs. Determined to drive the invaders back, the Germans held almost every advantage over the Rangers, as they fired small arms and threw grenades directly down on them, and cut ropes as the attackers were pulling themselves up. No less determined, the Rangers fought back. As some braved enemy fire to pull themselves up hand over hand, others on the beach below provided cover fire. Those Rangers to make it to the top, then in turn kept the Germans away from the cliff edge with cover fire from BARs, to enable the Rangers below to join them. Within fifteen minutes of landing, the majority of Force A had made it to the top and most had already set off after the objective, without waiting for orders or for units to consolidate. Using the bomb cratered landscape beyond the cliffs as cover, the Rangers quickly overran the six gun emplacements, only to find the guns missing. In their place were faux guns made from wooden poles. Undaunted, Rangers from all three companies then proceed farther inland to their second objective, the coastal highway to deny its use to the Germans; leaving behind Rudder’s HQ Company and portion of Rangers from Fox Company to maintain their foothold on the cliff edge of the Pointe. During the assault, at 0725 hours, communications officer Lieutenant James Eikner and his team set up their SCR-300 radio and broadcasted the code word “Tilt” to Force C, which was waiting out in the Channel. Though Eikner received an acknowledgment, it is unclear who acknowledged; leaving the Rangers of Force A to wonder what was happening out in the Channel. Meanwhile, the Force C flotilla, commanded by Lieutenant Colonel Max Schneider, which was supposed to turn towards Omaha Beach at 0700 hours, assuming that Force A had failed at Pointe du Hoc, was still waiting for the signal from their Ranger brethren. Schneider, aware of how important it was that the three Ranger companies assaulting Pointe du Hoc be reinforced, had ordered his landing craft to lay-to offshore, anxiously hoping for a signal from Rudder, but it never came. A breakdown in radio and visual communication prevented Schneider from receiving Force A’s transmission “Tilt”, sent by Eikner. Ultimately, Schneider was left with no choice but to follow the contingency plan and land at Omaha, then proceed overland to Pointe du Hoc and eliminate the guns if they were still operational. At 0740 hours, the ramps to the six LCAs carrying Able and Baker Companies of the 2nd Ranger Battalion, plus some HQ Rangers, went down and opened up to the killing zone of Omaha Dog Green and Dog White to the unsuspecting Rangers. Here they struggled to reach the base of the bluffs, while suffering a fate similar to that of Charlie Company and units of the 116th Regiment. Able Company’s newly promoted commander, Captain Joe Rafferty, had successfully crossed the beach without injury, only to turn back and urge his Rangers and infantrymen to move forward; because they would die if they remained on the beach. While doing this he was hit in both legs. Falling forward onto his knees into the rapidly rising tide, Rafferty continued urging men to get off the beach shouting, “Hurry! Hurry! Hurry or everybody’s going to get killed.” Moments later, a bullet struck him in the head. A medic immediately ran to his side and seeing that he was still alive held the mortally wound captain upright. Rafferty made an effort to raise both hands to his head, but expired. With other wounded men to tend to, the medic released the brave officer’s body, which the tide carried away. At the same time the rest of Force C, the entire 5th Ranger Battalion, was coming in right behind their fellow Rangers on Dog White. Learning that Dog Green was closed by naval officers because of the slaughter there and seeing Able and Baker Companies of the 2nd Rangers meeting the same fate on Dog White, Schneider elected to turn east to the next section, Dog Red. The bluffs overlooking this beach, Schneider observed, were obscured by brush fire smoke, a hindrance to enemy gunners visibility and that the beach itself had stone breakwaters jutting out from the seawall into the surf. It was ideal cover from the nonstop small arms fire. With hand and arm signals, he directed the flotilla to this beach. Though he probably didn’t realize it at the time, his decision would prove to be a turning point in the Battle for Omaha Beach. Landing on a front of beach extending to about 200 yards wide, the 5th Rangers exited the LCAs, crossed the beach and reached the seawall virtually intact, receiving little or no enemy fire, while units of the 2nd Rangers and the 116th were being cut to pieces on neighboring Dog White. It was shortly after this incredible landing on Bloody Omaha, that Brigadier General Norman Cota, the executive officer of the 29th Infantry Division, came ashore with his staff right behind the 5th Rangers. Completely unconcerned with the enemy fire striking all around him, Cota strode up and down the beach, heartening and inspiring the men of his division. When he reached the stone bay containing Schindler’s Rangers, he is reported to have shouted in exhortation “Rangers, lead the way!” A phase that has since become the motto of today’s modern Rangers. By 0810 hours, the 5th Rangers had blown gaps in the barbed wire beyond the seawall and begun moving up the bluffs by platoons, infiltrating and eliminating German positions as they went. Soon following, the depleted Charlie Company of the 116th Regiment, led by General Cota himself, broke through the German defenses nearby. Continuing the attack, the 5th Rangers linked up with the survivors of Able and Baker Companies of the 2nd Rangers, then proceeded to the planned assembly area near Vierville, in preparation for an overland march to Pointe du Hoc; but the heavy casualties sustained on Omaha prevented Force C from leaving to carry out its original mission. The first man to step off the ramp of LCA 668 was First Sergeant Leonard G. “Bud” Lomell, the senior NCO (non-commissioned officer) of Dog Company, who was grazed by an enemy bullet on his right hip, but fortunately it failed to strike bone and left Lomell with only a flesh wound. The force of the bullet caused him to lose his balance and fall into an underwater bomb crater twenty feet from the narrow beach; just below the cliffs of Pointe du Hoc. Lomell sank to the bottom of the crater, loaded down with his assault vest, gas mask, ammunition, helmet, grenades, sub-machine gun, pistol, a box of rope and a hand projector rocket; the latter two his carrying in both hands. Unable to escape the water trap, Lomell was helpless until two Rangers from his platoon pulled him out and dragged him to shore, where without hesitation he and the rest of his platoon immediately started up their ropes. After discovering that the guns of were missing from their emplacements, Lomell led the bulk of his platoon a mile inland to their second objective; the coastal highway. 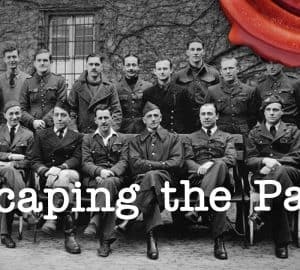 Once defensive positions were set up on the highway, the First Sergeant and his platoon sergeant, Staff Sergeant Jack Kuhn, discovered a country lane leading even farther inland down two hedgerows. Etched in its surface were fresh wheel tracks, which suggested to Lomell the presence of the huge guns being nearby. With Lomell in the lead and Kuhn beside him, the two Rangers followed the wheel tracks down the narrow lane. To their surprise, the tracks led them strait to five of the 155mm guns, hidden in an apple orchard some 200 yards square. The guns were aimed in the direction of Utah Beach, with ammunition stacked beside them at the ready. Theywere concealed in camouflage coverings to hide their presence from aerial reconnaissance. No sentries or gun crews manned them. 100 yards away, the two Rangers observed a German officer talking to between thirty and a hundred men at a farm road intersection. Lomell believed they were the gun crews. In the mid-afternoon, a German squad attempting to attack Rudder’s CP, most likely a probe, was ambushed by a BAR team consisting of two Rangers; killing the enemy squad’s machine gun crew in the proses. Shouting the German soldiers coordinates over to a mortar crew in nearby crater, the two Rangers waited until the zeroing in rounds drove the Germans from cover and into the open. All except one were cut down by the Ranger’s fire. This was the first organized movement by the Germans who, up until then, were scattered, confused, disorganized and trying to escape inland away from the Pointe. 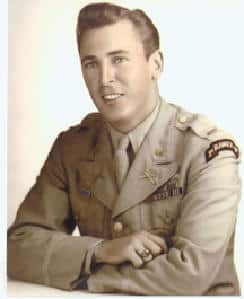 Once across the seawall on Omaha Beach, Lieutenant Charles “Ace” Parker, commanding officer 1st Platoon, Able Company, 5th Rangers, became separated and out of touch with Colonel Schneider’s HQ. Leading his twenty-two man platoon ahead of the 5th Rangers to the rally point near Vierville, Parker found the rest of the battalion missing. He assumed that they had moved on to Pointe du Hoc, when in truth they were still fighting for control of the bluffs overlooking Omaha, Parker set out for the 5th Rangers objective, having several firefights all the way. At one point, this tiny band of Rangers acquired forty German prisoners, which Parker had to free in order to avoid he and his men being captured themselves. Two hours before the sunset on June 6th, 2100 hours, Parker’s platoon arrived at Pointe du Hoc and Rudder’s CP on the cliff face. Finding that his battalion hadn’t reached the Pointe ahead of him, Parker assumed that they were following close behind. They were not. Nightfall gave Rudder a chance to assess his situation. Just over eighty Rangers from Dog, Easy, and part of Fox Companies, bolstered by Parker’s platoon, maintained a “L” shaped position, 300 yards long on each front, forward of the coastal highway; to meet any initial German counterattacks. Rudder, back on the Pointe with his CP and the rest of Fox Company, had little contact with the Rangers inland, except through messengers who were hindered by distance and shell torn terrain. Determining that any major German counterattack on Pointe du Hoc would have to deal with Rangers inland first, Rudder elected to have them remain in their positions south of the highway. Though one third of the original assault force was casualties, the slightly wounded were returning to the fight. Both on the Pointe and inland, the Rangers ammunition for their own weapons was nearly exhausted, many resorted to picking up weapons from fallen German soldiers to maintain their fire superiority. Though no Ranger officer held overall command of the “L” shaped position south of the highway, all agreed that if overrun by a major attack, with no significant reserves to repel a penetration, the units would fight their way back to the Pointe and regroup at Rudder’s CP. Just prior to midnight, a two man Ranger outpost was driven back by an enemy probing attack, preceded by shouts and whistles of the attackers. At 0100 hours June 7th, the Germans moved to 100 yards from the Rangers positions and followed up with another probe attack in the same area, resulting in Easy Company’s link to Dog Company being severed. At 0300 hours the Germans made their third and heaviest counterattack, preceded by mortars and intense machine gun fire. This time however, the Germans shifted their attack slightly east of the previous attacks, hitting both Easy and Fox Companies and missing the remnants of Dog Company altogether, which had become isolated from the battle. A platoon from Easy bore the brunt of the attack, losing nineteen men killed or captured. Lieutenant Robert Arman of Fox Company, the most senior officer present, ordered what remained of the “L” shaped defense to withdraw, leaving two Rangers with BARs to cover the retreat. Reaching the coastal highway 300 yards to the rear, Arman reorganized what remained, most of Fox Company, some from Easy and none from Dog Company. Word spread that the rest had been wiped out in the attack. At 0400 hours, some forty-eight Rangers from the highway defense trudged onto the Pointe and were placed in a last line of defense around the gun emplacements, with Rudders’s CP and cliffs to their backs. Told that Dog Company had been wiped out, Rudder took a fresh head count. Out of the original 225 men that had assaulted the cliffs the previous day, only 90 could still bear arms; many of those were wounded themselves and low on weapons and ammunition. Meantime, the twelve remaining Rangers of Dog Company maintained their original defensive positions south of the highway. Unaware of Easy and Fox Companies withdrawal, these Rangers kept themselves hidden in their foxholes and dugouts when morning light prevented any movement; due to the risk of discovery by the enemy. German prisoners are marched away at gun point past the command post. Because of the high casualties sustained on Omaha Beach by the 116th Regiment, which had lost 341 men killed on D-Day, senior army commanders saw the enlargement of that beachhead as a higher priority than the relief of Pointe du Hoc. A German counterattack on the morning of June 7th, which threatened the entire 29th Division’s position, caused the commanding general of the 29th to order four companies of the 5th Rangers to defend Vierville, the beach exit and the 29th‘s CP. Reasoning that the loss of three Ranger Companies at Pointe du Hoc was acceptable compared to the loss of the entire Omaha beachhead. 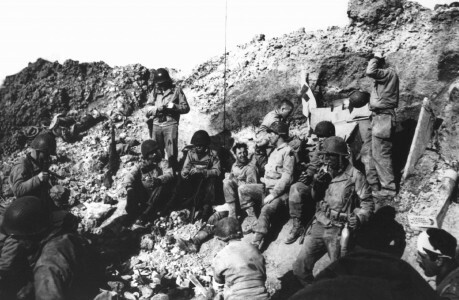 This decision prevented the Rangers of Forces B and C, who disagreed with the division commander’s decision, from immediately going to the aid of their fellow Rangers at Pointe du Hoc. Colonel Schneider pressed for and finally got the regimental commander of the 116th, Colonel Charles Canham, to organize a relief column for the besieged Rangers at the Pointe. The column consisted of the 1st Battalion of the 116th Regiment, Charlie and Dog Companies of the 5th Rangers, Able, Baker and Charlie Companies of the 2nd Rangers, and eight tanks of Baker Company of the 743rd Tank Battalion. This column began to move toward Pointe du Hoc at 0800 hours and initially encountered little resistance. Around 1200 hours, they reached the hamlet of St. Pierre du Mont and were only one thousand yards from Pointe du Hoc, when they were halted by German artillery, small arms fire and a huge crater in the center of the road flanked by mine fields. Colonel Canham, out of concern for the Omaha Beach lodgment, prevented further advance that day by orderring the tanks of the 743rd to return to Vierville for the nightThe 2nd and 5th Rangers of Schneider’s task force had no choice but to dig in for the night. Communication with the warships off shore had by this time improved for Rudder’s Rangers on the Pointe and was vital in driving back German counterattacks, which grew weaker throughout the day. Around midday, two LCVPs brought in a small contingent of reinforcements to the beleaguered Rangers from the sea. Organized by Major Jack Street, a veteran Ranger of the North African and Sicily campaigns, some sixty men from the 1st Platoon of Fox Company of the 5th Rangers and a dismounted cannon platoon, reinforced Rudder’s defense. After delivering this small relief party, the landing craft took off thirty-four wounded Rangers and twenty-eight German prisoners that were taken aboard the battleship U.S.S. Texas. At 2200 hours, German units ceased their counterattacks on Pointe du Hoc, out of men and resources. In the early hours of June 8th, the Ranger forces from Omaha and the 1st Battalion of the 116th made a direct attack on Pointe du Hoc to relieve Rudder’s Rangers. This attack was supported by the 2nd and 3rd Battalions of the 116th and tanks from Companies Able and Charlie of the 743rd Tank Battalion, which attacked west towards Grandcamp then swung right to envelop any retreating Germans from the Pointe. However, the 3rd Battalion of the 116th, upon hearing the distinct sounds of German machine guns firing from Pointe du Hoc, and unaware that Rudder’s men were using captured enemy weapons, opened fire on the Rangers; resulting in four being killed and three wound before an officer from the 2nd Rangers put a stop to it. At the same time the twelve Dog Company Rangers were discovered by lead elements 116th, led by Colonel Canham himself. With all the Ranger forces linked up and their missions on Pointe du Hoc as well as Omaha Beach accomplished, they moved on to new objectives as part of the larger Allied advance into Normandy and beyond the beaches. World War II was the single greatest struggle the world has ever seen and certainly was the final conflict of epic scale since the last half of the twentieth century, but for all its vastness and staggering quantities of men and material employed by the Allies to defeat the Axis forces of tyranny, it was relatively small groups of individual units like the 2nd and 5th Ranger Battalions, made up of ordinary men who accomplished the extraordinary, that won the war and laid the foundations for peace. 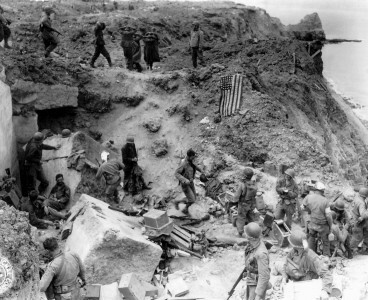 In destroying the enemy gun battery at Pointe du Hoc and providing critical support for the disastrous assault on Omaha Beach, the Rangers contributed significantly to the success of D-Day and saved many lives that could have been lost. However, they paid dearly for this victory. The 2nd Ranger battalion suffered 263 causalities in the forty-eight hours between June 6th and 8th, 70 of which were killed in action, out of 545 men and officers that originally comprised the battalion. The 5th Ranger Battalion also suffered heavy casualties, losing over a hundred men killed or wounded during the same time. Both units received the Presidential Unit Citation in 1945, which is the highest award a unit can be presented with in the U.S. Army, and the French Croix de Guerre. 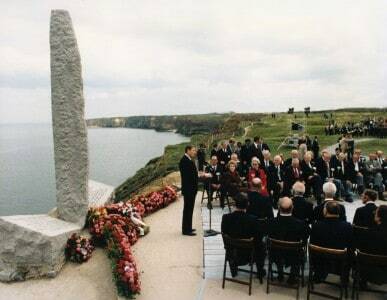 On June 6th, 1984, President Ronald Reagan in his speech about these men, that he called “the Boys of Pointe du Hoc,” epitomized their bravery and selflessness to evoke the magnificence of the generation that fought this war and sacrificed for the freedom of future generations. To remember what the Rangers did on D-Day and the days that followed, is to better understand the cost that an entire generation paid for posterity. Black, Robert W. The Battalion The Dramatic Story of the 2nd Ranger Battalion in World War II. Stackpole Books. 2006. Black, Robert W. Rangers in World War II. New York: Ballantine Books, 1992. This statement is incorrect. There is NO order that exists for the Rangers to block this road. This was an order generated by Lt. Col. Rudder on the day… is was not a Battalion objective. There is a big difference. In fact if you find some of the many newly released sets of actual Rangers orders prior to D-day you can see that Lt. Col. Rudder was in actual fact ordered to go to Grandcamp and then attack the gun batteries at Maisy… on D-day. Where Would the United States Be Without Haiti? What Made Napoleon a Great Leader? 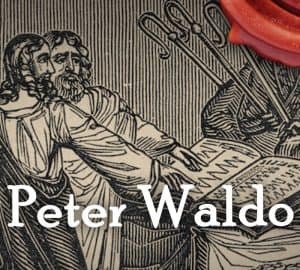 Was Sherman a War Criminal?